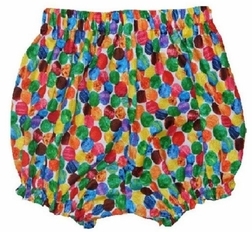 We love this fabric based on Eric Carle's stories, here The Very Hungry Caterpillar turning in to a butterfly. 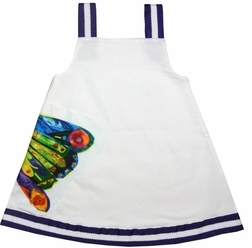 We start with white cotton fabric and make a simple, yet sweet square neck aline dress. 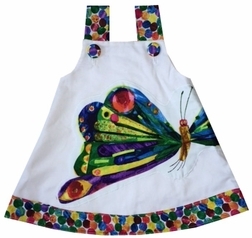 The shoulder straps and the hem of the dress are embellished with your choice of purple grosgrain ribbon with scalloped white ribbon sewn on top OR Eric Carle's dotted fabric. The shoulders fasten with buttons covered with the coordinating dotted fabric. 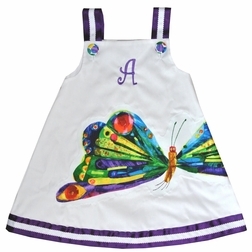 On the dress we do a hand sewn applique using a fabric printed Butterfly. The Butterfly starts on the front of the dress and extends his way around to the back via the right side! The dress may be monogrammed in purple.